Salvia is a genus, or division, in the huge, flowering mint family (Lamiaceae). So Salvias -- also called sages -- are the plants within that genus. Colorful, often fragrant and in some cases edible, sages are native to a wide variety of environments around the world. Most are easy to grow if you select the right types for local growing conditions. For example, many are drought resistant and excellent choices for dry or low water gardens. They adapt to a variety of well-drained soils -- including rocky settings -- as long as they aren't overwatered. But, at the other extreme, there are a number of Salvias that need loamy, fertile, garden soil and plentiful water. 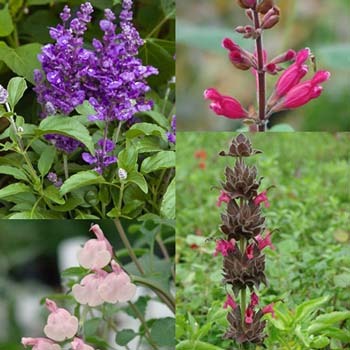 You'll find many kinds of shrubs, including evergreens and deciduous types among Salvias. Some grow so tall that they are referred to as being "tree-like." Many shrubby Salvias combine woody growth and soft herbaceous foliage. They are subshrubs that act like perennials, dying to ground in areas with cold winters. Salvias also encompass a wide range of perennials, including varieties of Culinary Sage (Salvia officinalis spp. and others) that can survive cold weather and grow back year after year. But some perennial sages are referred to as tender. In areas with warm winters, tender perennial sages may emerge each year in spring. However, where winters are chilly, tender perennials, such as Tropical Sage (S. coccinea), are popular annuals in seasonal flowerbeds. Scientific classification assigns plants to families and then to divisions within those families, each of which is called a genus. Salvia is the largest genus in the mint family and contains about 900 species. A species is a group of plants that have similar physical and genetic characteristics. These traits are specific to the group and aren't necessarily shared by the genus overall. You might think that all sages are Southwestern sun-loving plants, but that description only fits certain species. Also, although some Salvia species are so closely related that they freely hybridize -- such as Autumn Sage (S. greggii) and Mountain Sage (S. microphylla) -- the likelihood of many others crossing is improbable. For example, Anise Scented Sages (Salvia guaranitica spp.) look and smell far different from Autumn Sages. The two species, each of which includes multiple varieties, don't appear to mate. Whether short groundcovers or towering shrubs, Salvias are excellent choices for wildlife gardening. The pollen and nectar of their tubular flowers are quality sources of protein and carbohydrates; their seed feeds many a songbird. Depending on species, a Salvia species may appeal to bees, butterflies or hummingbirds. Many appeal to all three as well as other insect pollinators. For those who live in deer country, it's good to know that unless terribly desperate, deer don't eat Salvias. It appears that powerful plant chemicals deter their taste buds. Salvias are known scientifically as the true sages, but there are other plants commonly called sage. These include the mint-family member Russian Sage (Perovskia atriplicifolia) and various kinds of Sagebrush (Artemesia spp.) from the daisy family (Asteraceae). Although these plants can be good companions in a Salvia garden, we primarily grow true sages at Flowers by the Sea. For information about any of our Salvias and companion plants, please call or email us at FBTS. We're chock full of truly good advice for helping you get started growing Salvias.